Our OMNI theme is a premier multi-purpose template that is well suited to a large variety of website themes. 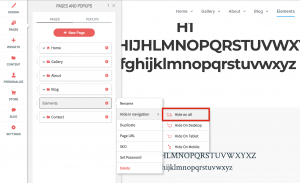 As a great demonstration of what’s possible in the site editor, OMNI features video backgrounds, numerous image galleries, a blog, and multiple layout options per page. You may notice that several pages in the OMNI theme have backgrounds that use two different colors; one on the left, and one on the right. This creates a dramatic effect for page content, especially when images are used offset. Let’s take a look at how to edit these types of pages. Click on any row with a split background. Go to the Style tab, and note the background image. An image has been prepared that is white on the left half, and transparent on the right. Anytime this image is set as a row image, it will make the left half of the row white, while the right half will show the row background color. Even when a background image is set in a row, as described above, you may still set a row color. In terms of layer visibility, the row image will always cover up the row color. In this case, since the image uses transparency, the row color is seen through the transparent half of the row image. To set the color that will be seen on the right side of a row using the split image, simply change the Background Color. The example below uses a dark gray color. You may use rows in repetition down a page to create a full page color split. In the Omni theme, we use images placed in rows using offset columns. While the columns have already been offset and do not need to be changed you may control the amount of offset by hovering your cursor over the divider between columns until a blue adjustment bar appears. Slide this bar to the right or left to adjust the offset. 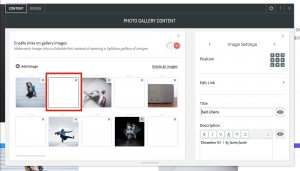 In the content area of a photo gallery, alternate images with a blank solid color image file. You can prepare a solid color image in any photo editor. Select a blank gallery thumbnail, and enter any title, description and button text you like. 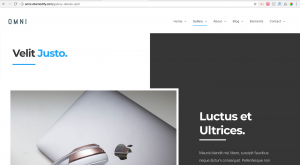 This site uses an elements page to display heading and paragraph styles. Feel free to refer to it to get a feel for these global style settings. If you wish to change any style setting, this can be done in the Design area of your site editor toolbar. Before publishing your site, you will want to delete or hide this page. Go to Pages, select the Elements page, and delete or hide it.